For more than a year, WCS and our conservation partners have focused on three essential prongs in the battle to end the illegal ivory trade: stop the killing, stop the trafficking, and stop the demand. Today we must scale up those efforts if we want to truly end the elephant crisis--to give the elephants of Africa a chance to recover, to help ensure that the peoples of Africa do not lose this majestic part of their heritage, and to help prevent a growing crisis undermining sustainable development. For many countries in Africa, elephants are not only a part of their natural heritage, but their very patrimony.Credit: Julie Larsen Maher ©WCS. A major meeting was held this week in Botswana on the conservation needs of the African elephant given the ongoing poaching crisis across the continent. This meeting followed a summit held in the country fifteen months earlier, at which governments agreed to 14 "Urgent Measures" to address the catastrophic decline of African elephants. The meeting this week sought to assess progress against those measures. There have been many positive developments. A range of essential actions by individual governments have been undertaken, with some laudable efforts, but they remain insufficient. Governments must go after the kingpins and organized crime networks that are profiting the most and driving the illegal trade. In many parts of Africa, poaching of elephants remains out of control, with criminal syndicates still working through corrupt officials to traffic massive quantities of ivory, mostly to Asia. It is clear from the data presented at the meeting, including by CITES, that Africa's elephants are still in decline. Recent data from a study led by George Wittemyer showed that 100,000 elephants were killed illegally over the 3-year period up to the end of 2012. WCS President and CEO Cristián Samper with WCS/Niassa Reserve field op team investigating carcass left by poachers. The elephant is believed to have been killed with an AK-47. Photo by Alastair Nelson ©WCS. Work led by WCS has shown that the forest elephants of Central Africa declined by 65 percent between 2002 and 2013. As the Director of Gabon's National Parks, Professor Lee White, reported at this week's meeting, it is possible that the figure will expand to 70 percent once data from 2014 are included in the analysis. Moreover, data emerging as a result of the Great Elephant Census funded by the Paul G. Allen Family Foundation is also revealing significant declines in Africa's savannah elephants. Sadly, more bad news is expected. Clearly this is no time for easing up on our efforts to protect Africa's elephants. Indeed, there is a need for redoubled efforts. Despite the urgency of the situation, I am sad to report that no particularly strong outcome emerged from this week's meeting, which was attended by representatives of more than 20 governments - including African elephant range countries as well as the U.S., UK, Germany, France, the European Commission, Japan, Vietnam, and China. Data emerging as a result of the Great Elephant Census funded by the Paul G. Allen Family Foundation is revealing significant declines in Africa's savannah elephants. Credit: Julie Larsen Maher ©WCS. In addition to WCS, the meeting drew several other conservation organizations, as well as intergovernmental organizations such as the World Bank, the United Nations Development Program (UNDP), INTERPOL, and the CITES Secretariat. Unfortunately, because time was limited, WCS and the other participating conservation NGOs were not able to address the meeting and make recommendations. •	Governments must massively increase anti-poaching work on-the-ground, with a particular focus on capacity building, training of rangers, and provision of sufficient tools and equipment to properly stop poaching; donor governments and agencies should significantly increase their funding and technical support for this critical work. 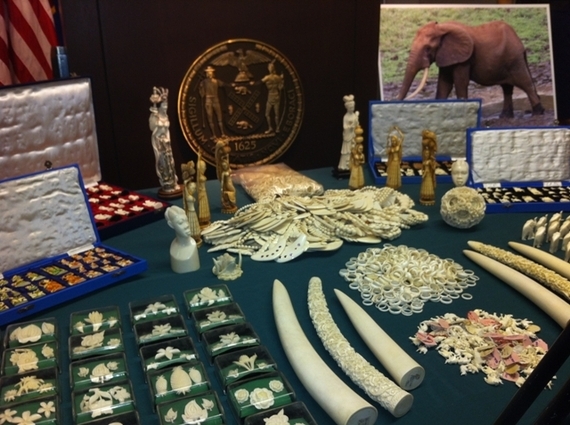 •	There must be much greater effort to convict wildlife trafficking kingpins and to use intelligence-based law enforcement to disrupt trafficking networks through successful prosecutions. •	Efforts should increase to change consumer behavior ("demand reduction") in countries where illegal ivory is imported and sold rather than simply raising greater awareness. There must be consistent, quantifiable measures to measure changes in consumer behaviors. •	Countries around the world need to close any legal domestic ivory markets; the existence of legal markets, whether in Shanghai, London, or Los Angeles, undermines anti-trafficking efforts by allowing illegal ivory to be sold (or "laundered") under the cover of the legal trade. •	Efforts must be increased to stem the scourge of corruption throughout the trade chain. Corruption and weak governance must be addressed in a meaningful manner. We must all not be afraid to address greed and corruption, which are the underlying drivers of this crisis. While action in Asia, where the demand for ivory is the highest, has rightly been a key focus in anti-poaching efforts, African range states must likewise look within their own governance structures if there is to be hope for the future of elephants. We must all not be afraid to address greed and corruption, which are the underlying drivers of this crisis. It is not the poor poacher who is the worst offender--poverty exacerbates wildlife trafficking but doesn't cause it. Governments must go after the kingpins and organized crime networks that are profiting the most and driving the illegal trade. The shortsightedness with which corruption is tolerated will, if left unabated, result over time in the loss of one of Africa's most revered and iconic species in large parts of its range. Credit: Julie Larsen Maher ©WCS. For many of these countries, elephants are not only a part of their natural heritage, but their very patrimony. The shortsightedness with which corruption is tolerated will, if left unabated, result over time in the loss not only of one of Africa's most revered and iconic species in large parts of its range but the economic prosperity of so many African nations for which elephants play an essential part.